LAUGHLIN, NV, – We at the Laughlin Chamber of Commerce cordially invite you to join us at the 32nd Annual Chef’s Food Fest! The Chef’s Food Fest is well known as a leading community experience and has been a sellout each year, for the past thirty-one years! During the evening our guests will enjoy endless courses, fine beverages, and exquisite confections prepared by some of our area’s top chefs and mixologists. 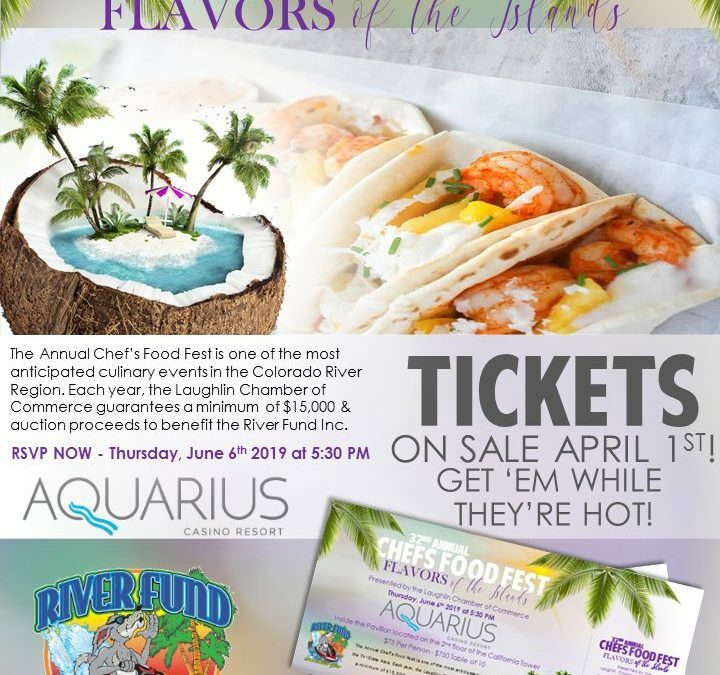 The 32nd Annual Chef’s Food Fest will be taking place, Thursday, June 6th at The Aquarius Casino Resort in Laughlin, NV and will be themed “Flavors of the Islands”. Following suit with the “Flavors of the Deep South” theme from last year’s event & “Flavors of the Desert” in 2017. In 2017, we introduced the first ever “secret ingredient” – Prickly Pear Cactus was a required ingredient to be used in at least one of the Chef’s masterpieces in order to be judged. In 2018, the secret ingredient was the ever-popular sweet potato. This year will also have a secret ingredient! The secret ingredient will be announced at a later date and expected to be used in at least one of your edible presentations. The best use of this ingredient will win the newest trophy category; “Best use of Secret Ingredient”! We will continue with the previous years “Best Booth”, “Best Food”, “Best Dessert”, and “Best Drink”. As you may know, this evening also features a live charity auction that benefits the River Fund, Inc. This sensational event is one of the Laughlin Chamber’s major fundraising events. Each year, the Laughlin Chamber makes a commitment to donate a minimum of $15,000 to the River Fund, Inc., and in some past years we have been able to donate over $20,000! The 32nd Annual Chef’s Food Fest tickets will go on sale April 1st – $75 per person or $750 for a reserved table of 10. They will go fast, so do not wait! If you would like to sit with your friends & family, please consider purchasing a reserved table of 10 as there will be assigned seating. If you or your business are interested in participating in this year’s event, you can still sign up! We are now also accepting charity auction donations as well as sponsorships. You can request information at michelle@laughlinchamber.com. If you would like more information about this topic, please contact Michelle Crider at 702-298-2214.